Summoning a memory from growing up in Union City, Menendez said there was a bully who had slapped him during their first encounter and punched him in their second, while his mother told him to ignore the bully. “It wasn’t until the third time, when we were by a construction site, I got a piece of wood and whacked him and never got bothered by that bully again,” Menendez said, arguing for the same treatment of Assad. After wiser heads prevailed, the United States and Russia brokered a deal in the UN Security Council to remove Syria’s chemical weapons. Though the process hasn’t been easy (you try trucking a bunch of sarin gas out of a country in the middle of a civil war), Assad is now working with the Organisation for the Prohibition of Chemical Weapons to identify and ultimately destroy Syria’s chemical weapons stockpiles. That result surely wouldn’t have come about had the Obama administration listened to Menendez. What’s more, Menendez sponsored a bill earlier this year that would have armed the Syrian opposition. But after Syria’s Islamic Front, a group of Islamist hardliners, essentially outmaneuvered the more secular Free Syrian Army earlier this month, much of the mostly non-lethal aid provided to the Syrian rebels ended up in the hands of jihadists. Again, had the Obama administration listened to Menendez, jihadists would have instead taken possession of stocks of US-provided arms. There’s also Menendez’s outdated Cold War-era position in favor of retaining the half-century US embargo against Cuba, a position that might be the most irrational in the entire oeuvre of US foreign policy — in that it’s failed to isolate the Castros economically, that it’s given the Castros legitimacy within Cuba and Latin America for standing up to US imperialism in the region, that it’s completely outlived its goal 23 years after the collapse of the Soviet Union, and that it showcases the kind of heavy-handed tactics of the state (by prohibiting US citizens to engage in commerce with Cuba) in a way that you’d expect in a closed society, not in a liberal democracy. You don’t have to approve of Fidel or Raúl Castro or their multiple economic and human rights failures to agree that the continuation of the US embargo is inane. But it’s not just that Menendez supports the embargo — it’s one of his pet projects, making him nearly as much of an ideologue on the matter as Helms was in the 1980s and the 1990s. For instance, Menendez sent a letter to the then-president of Cyprus, Dimitris Christofias, in 2009 in rebuke after Christofias, a communist, expressed some admiration for Castro on a state visit to Havana (Christofias described himself as ‘an old comrade and a friend of Cuba and the revolution’), though that seems hardly the most pressing use of the time of a US senator. Within the US Congress, there’s no person or position more important to foreign affairs (and world politics) that the chair of the US Senate Committee on Foreign Relations. The men (and so far, just men) who have held this position are some of the most respected names in US political history. Henry Clay, a pre-presidential James Buchanan and Republicans Charles Sumner and John Sherman all held the post in the 19th century, and Republican Henry Cabot Lodge held the position in the immediate aftermath of World War I. But it was the Democratic senator from Arkansas, William Fulbright, a vocal opponent of the US war in Vietnam in the late 1960s and early 1970s, who really made the position what it is today as. Since Fulbright, the post has been a perch from which to challenge, investigate and otherwise needle the White House on foreign policy — it’s one of the most important checks against the increasing ratchet upward of executive power. A long line of respected senators have recently held the position, including Republican Richard Lugar of Indiana, Democrat Joe Biden of Delaware (now vice president) and Democrat John Kerry of Massachusetts (now secretary of state). 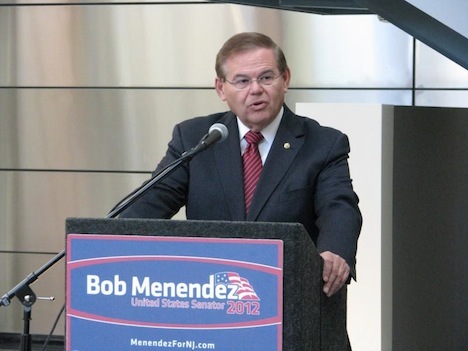 Unlike Kerry (and Biden and Lugar), Menendez came to the US Senate only in 2006, which means that he had barely completed one term in the US Senate before assuming what might be the most prestigious senatorial chairmanship. Even Republican Jesse Helms of North Carolina, the most conservative senator to chair the committee, left an indelible foreign policy mark in the form of tying US aid to accountability within the United Nations, his opposition to the International Criminal Court and, however belatedly, cleared the path for US aid to combat the spread of HIV/AIDS in sub-Saharan Africa. But however radical Helms’s positions may have been, he was never under FBI investigation. In his first year as chair of the Senate Foreign Relations Committee, Menendez, who got his political start in the most corrupt New Jersey machine politics, remains under grand jury investigation for corruption. On the two most pressing foreign policy issues that the United States faced in 2013 — Syria and Iran — Menendez has already been proven wrong on the former, and he’s actively working against his own party’s administration on the latter. Previous PostWho is Sebastian Kurz? Meet Austria’s new 27-year-old foreign minister.Next PostAfter local elections, what next for Venezuela’s government?